Keto Macadamia Nut Cookies Recipe - EASY Low Carb Snack! 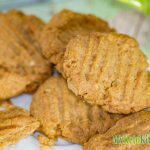 Give these Macadamia Nut Butter Cookies a go, they are easy to make and are great to pop in your bag for an on the go keto snack. Preheat fan forced oven to 320F/160C. Roll into teaspoon sized balls and press onto lined baking tray. The cookies will need to be pressed into their desired shape as they have minimal spreading. They can be placed quite close together. Bake the cookies in the preheated oven for 12 minutes or until golden brown, with the edges starting to harden. The cookies with continue to harden as they cool.